IntelliMagic Direction is a powerful and versatile disk storage system performance planning product. IntelliMagic Direction, a vendor-neutral version of our original product that we license to IBM, Disk Magic, is in use around the world to analyze and predict storage system performance, and to evaluate growth and acquisition scenarios using measured I/O workloads. IntelliMagic Direction supports all popular disk storage system configurations from EMC, HDS, HP and IBM, attached to z/OS, i/OS, TPF, UNIX, Linux and Windows hosts. 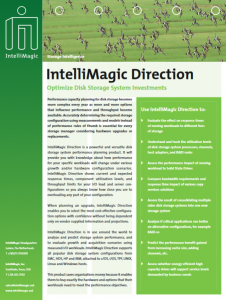 This brochure shows how IntelliMagic Direction saves organizations money by enabling them to buy exactly the hardware and options that their workloads need to meet the performance objectives.